Landscape Drainage in Midwest City. Do You Need It? Home → French Drains → Landscape Drainage in Midwest City. Do You Need It? 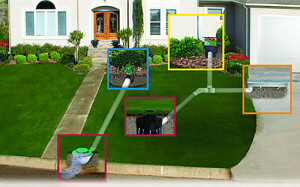 any homeowners and businesses are needing to implement a landscape drainage plan. Landscape drainage problems can cause serious damage to the foundations of your home and and can also adversely affect your landscaping and plants. Plant and tree roots that are sitting in water can easily rot, causing the death of the whole plant. True, there are some plants and trees – willow for example – that actually like their roots in water, but they are in the minority. If you live on the top of a hill then you may have no problem. But if your property is on the lower part of a slope than your neighbor then, while to some extent it is dependent on the nature of your soil – it is quite probable that you could have problems with the proper landscape drainage for your property. Furthermore, if water is continually seeping into your yard it may also cause problems if there is a cellar or storm shelter, which can start to fill with water. So some form of landscape drainage becomes essential for many properties. h is then filled with a perforated pipe with additional gravel inserted around the pipe. While it is possible to install a French drain on your own, there are many nuances to properly installing it properly and that is why you should call the experts at Riemer and Son to do this for you. There are so many different factors and complications involved, so it is far better to employ professionals who really know what they are doing. Riemer and Son have been in the business of landscaping and drainage in Midwest City and the OKC Metro area for the last 30 years and we are specialists in the field. We will survey your yard and ascertain the best place in which to install the drain, which will vary depending on your specific yard landscape and building placement. We will determine the best place to re-route the water. We also have to be certain that this will not affect any of your neighbors land as, if it does, it is possible you could end up with a law suit against you! There are also many other factors to be considered. For example, electricity cables and sewage pipes have to be taken into consideration, but you are in good hands with Riemer and Son as we know how to contact all the local utilities to ensure that these are avoided. 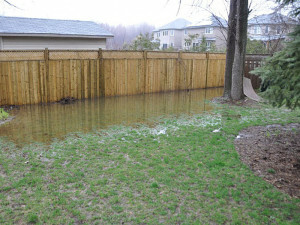 If you should find that your yard still floods, then you may need to install a float or sump pump. This is a pump which automatically switches on when water gets to a certain level and pumps it up and outside the property and then into a drain. We are experts at the installation of sump pumps, and again proper placement is the key to doing this correctly. It is a question of getting everything just right – if you have excess water on your property it needs to be handled correctly. Normally, a hole is dug at a strategic location in a low part of the yard and the pump installed in the hole. The float is set so that when the water level rises the float automatically switches the pump on, thus ensuring that the water is continuously pumped away before it ever reaches flood levels. Many times we can add additional landscaping to blend this into your overall landscaping so that it is not noticed. Riemer and Son will gladly give you a free quotation without any obligation. Please call us at (405) 639-7648 to schedule a time when we can survey your property and determine the best solution for your landscape drainage problem. We have proudly served the Midwest City, Oklahoma area for all your landscaping, irrigation and landscape drainage solutions for over 30 years.